I honestly have no idea why I didn't watch Iron Man (2008) before now. I have been missing out on such an awesome movie! Superhero movies usually aren't my cup of tea, but this one is not the sort of superhero movie you find in a bargain bin at the Warehouse. Tony Stark (Robert Downey Jr.) is a billionaire head of a weapons manafacturer who was captured in enemy terroitory, with what seems as no way of getting out. But thanks to his genius ideas, he builds a suit of armour to escape-and succeeds. Stark realises that he is on to something, andd he modifies that suit and makes himself 'Iron Man', becoming a reluctant hero along the way. This is a surprising film. I think it is because it is not too outlandish and unbelievable, and that many can actually relate to this hero, which is a rare and redeeming quality little seen in these types of films. Iron Man is totally dominated by Robert Downey Jr., who is definitely one of the greatest actors to appear on our screens in the past few years. This film has everything a film needs, and just blows it up. So, we know it's great. Honestly, if you haven't seen Iron Man, I suggest you run down to the DVD rental store and get it out, it is amazing! I ADORE this movie! 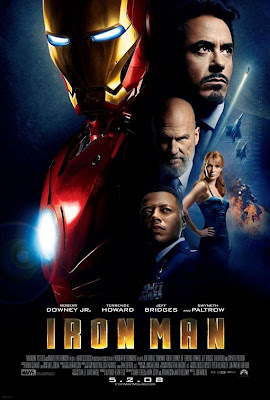 My local theater is showing this right before the midnight showing on Iron Man 2 on Thursday - I can't wait! !